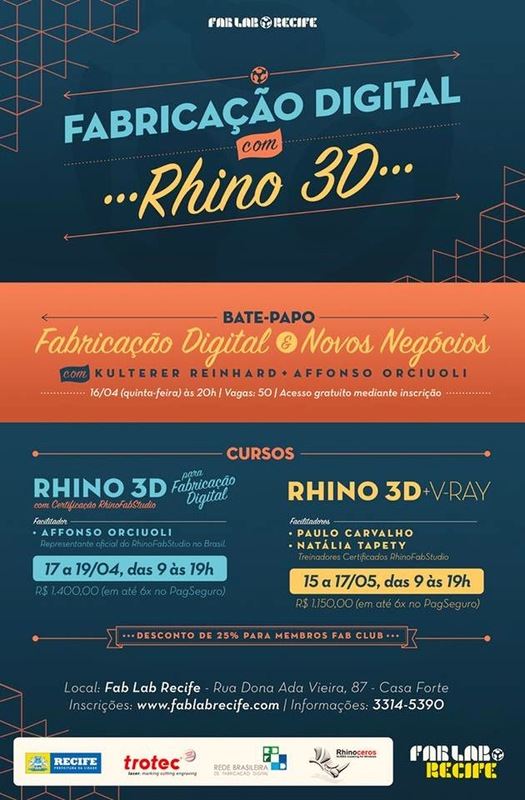 The Fab Lab Recife is applying to become a certified RhinoFabStudio as well as an Authorized Rhino Training Center (ARTC) for the northern and northeastern regions of Brazil. Fab Lab Recife is offering courses in Rhino, Grasshopper, and others. Fab Lab Recife will host a special event on Thursday, April 16 at 8 pm with a open talk about Digital Fabrication and business possibilities with digital manufacturing. We will also celebrate the certification of the Fab Lab Recife as a RhinoFabStudio in Brazil. Meet Kuterer Reinhard, manager of Trotec (laser cutters) Latin America, and Affonso Orciuoli, one of the RhinoFabStudio's Mentors.